We invite you to watch LIVE the broadcast on our website! 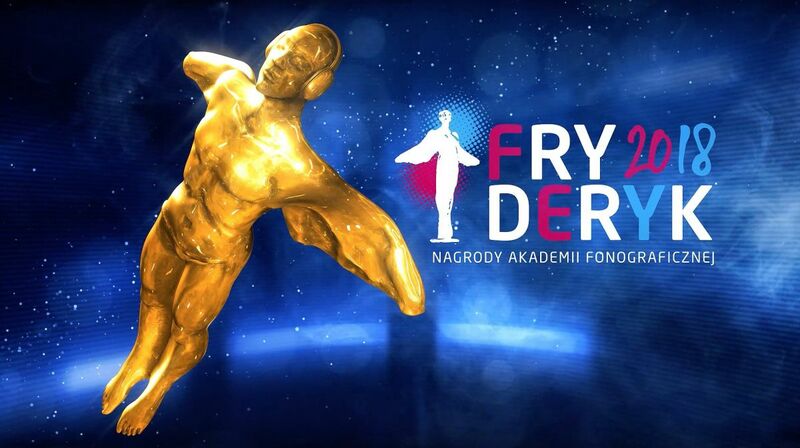 We invite everyone to watch LIVE on our website (here > below) the Gala of Awarding the Phonographic Academy Awards "Fryderyk 2018" in the categories of pop and jazz music on Tuesday, April 24, 2018 at 8pm - 120 minutes (online). This is the first such broadcast of Fryderyk's on the internet. We are pleased to inform you that during this year's XXIV. The Fryderyk 2018 gala at the Polish Theater in Warsaw featured, among others: Daria Zawiałow, Krzysztof Zalewski, Ania Dąbrowska, Grzegorz Hyży, LemON, Anita Lipnicka & The Hats, Paulina Przybysz, Grubson, Mioush, Natalia Nykiel, Tulia, Pianohooligan - Piotr Orzechowski, Marek Napiórkowski, Kuba Więcek, Dominik Wania, Michał Miśkiewicz, Slawomir Kurkiewicz, Zespół Laboratorium and the female part of the Mitch&Mitch formation: Joanna Sokołowska and Aleksandra Bilińska (Tribute To Zbigniew Wodecki) and a special guest - Basia Trzetrzelewska. And all of them in unusual musical combinations and medleys. The event was hosted by Agnieszka Szydłowska and Piotr Metz. Kuba Karaś (The Dumplings) and Wojtek Urbański (Rysy) took care of the musical setting of the gala. During the event, on the stage (handing) and in the audience, there was also a large group of other, the most outstanding Polish authors and artists. Emissions of the Fryderyk 2018 gala "live" 24.04 from 8pm: HERE on our website www.stxmusic.pl, as well as in the TVP Kultura channel and in Trójka - Program 3 of the Polish Radio. Retransmission - on the same evening in the television TVP2 from 10:55pm (two hours). For the twelfth time, the organizer of the gal is STX JAMBOREE agency commissioned by the ZPAV Audio-Video Producers Association and the Phonographic Academy. The honorary patronage over the event was taken by the Minister of Culture and National Heritage. Partners: Channel TVP Kultura, Program 2 TVP, Program 3 PR. Cooperation: Legal Culture, PRESS-SERVICE Monitoring Mediów. Media Patrons: Polish Television's Second Program, TVP Kultura, TVP VOD, radio Trójka, radio Dwójka, Co Jest Grane24, AMS company, Uroda Życia magazine, VIVA! Magazine, Multikino Polska. Partners of the cocktail and after party: French hairdressers Franck Provost, the Ballantines brand, the Wyborowa brand and the Harenda club. Other Internet broadcasts by www.tvpvod.pl, Polskie Radio, ZPAV and ZAiKS. WE INVITE YOU TO WATCH OUR TRANSMISSION!